Rick’s Bail Bonds offers bail bond services in Fort Pierce, Saint Lucie County so your loved one can get out of jail. We bring families back together. Because we have been in the industry since 2000 we have steadily become one of the best and most trusted bonding companies in Florida. Rick’s Bail Bonds takes pride in service and guarantees a professional, friendly, personal relationship in order to serve you. We understand bail bonds may be stressful so we promise to make this as stress-free and easy as possible. We are with you every step of the way because we are local. Through our bail bond services we post bonds anywhere in the surrounding counties – Fort Pierce, Saint Lucie County, Martin County, Indian River County – day or night. If you need our help due to a jailed loved one, do not hesitate to call us at 772-444-Bail (2245). You can sign for bail from your cell phone. Ask us how. 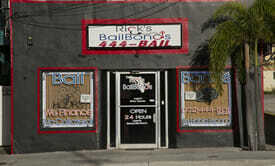 Rick’s Bail Bonds is conveniently located in Fort Pierce near the jail and open 24 hours a day, 7 days a week. As a result, making it as easy as possible to release your loved one quickly. Because of our convenient location for bail bond services, we are able to post bail within minutes of receiving information. Call us at 772-444-2245 for immediate bail bond services. Our paperwork in now digital. You can complete paperwork from the comfort of your home or smart phone, iPad or computer. The release time after the jail receives our release order is generally one hour or less for local police stations and 2-4 hours for county jails. Generally speaking, the busier the holding facility, the longer it takes, so we act fast once you call us. You may call us for a Free Warrant Search. For your convenience, payment plans are available and we accept major credit cards. Often, the first question is, “How do I bail someone out of jail?”. The only way in the state of Florida and St Lucie County is through a bail bond service, such as Rick’s Bail Bonds. If you are unfamiliar with the bail bonds process, call us and please see Question and Answers that can help answer any bail bond services questions you may have.